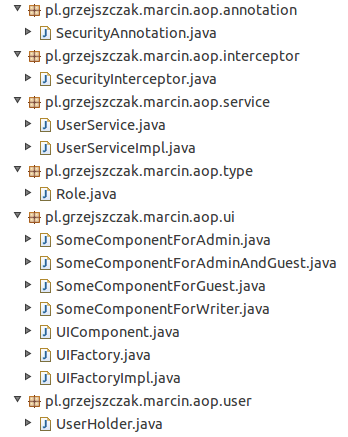 Now let's take a look at the most interesting lines of the Spring's application context. First we have all the required schemas - I don't think that this needs to be explained in more depth. which enables the @AspectJ support. we want to create the aspect by ourselves and provide the factory-method="aspectOf" . By doing so our aspect will be included in the autowiring process of our beans - thus all the fields annotated with the @Autowired annotation will get the beans injected. The class UserServiceImpl is immitating a service that would get the current user information from the db or from the current application context. This is a simple holder class that holds information about current user Role. Role is an enum that defines a role for a person being an Admin, Writer or a Guest. An abstraction over concrete implementations of some UI components. This component is an example of a UI component extention that can be seen only by users who have roles of Admin or Guest. Annotation that defines a roles that can have this component created. A factory class that given the class of an object that extends UIComponent returns a new instance of the given UIComponent. 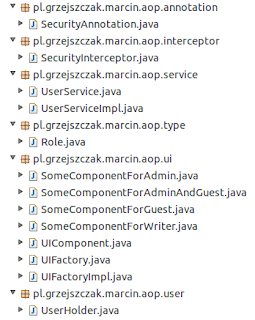 This is the aspect defined at the pointcut of executing a function createComponent of the UIFactory interface. Inside the Around advice there is the logic that first checks what kind of an argument has been passed to the method createComponent (for example SomeComponentForAdminAndGuest.class). Next it is checking if this class is annotated with SecurityAnnotation and if that is the case it checks what kind of Roles are required to have the component created. Afterwards it checks if the current user (from UserService to UserHolder's Roles) has the required role to present the component. If that is the case thisJoinPoint.proceed() is called which in effect returns the object of the class that extends UIComponent. The unit test shows that for given Admin role only first two components get created whereas for the two others nulls are returned (due to the fact that user doesn't have proper rights). That is how in our project we used Spring's AOP to create a simple framework that would check if the user can have the given component created or not. Thanks to this after having programmed the aspects one doesn't have to remember about writing any security related code since it will be done for him.